In addition to the huge White Stork above, there were a dozen White Ibis, several Great Egrets, and a host of others sloshing around in one small marshy spot yesterday morning. Must have been some tasty breakfast snacks available. They were literally lined up on the boardwalk railings, and kept taking turns flying in and out of the water. On the right side, the Cattle Egret took center stage. . . .
And directly across, on the left railing, the Snowy Egret was first in line, ready for take-off. 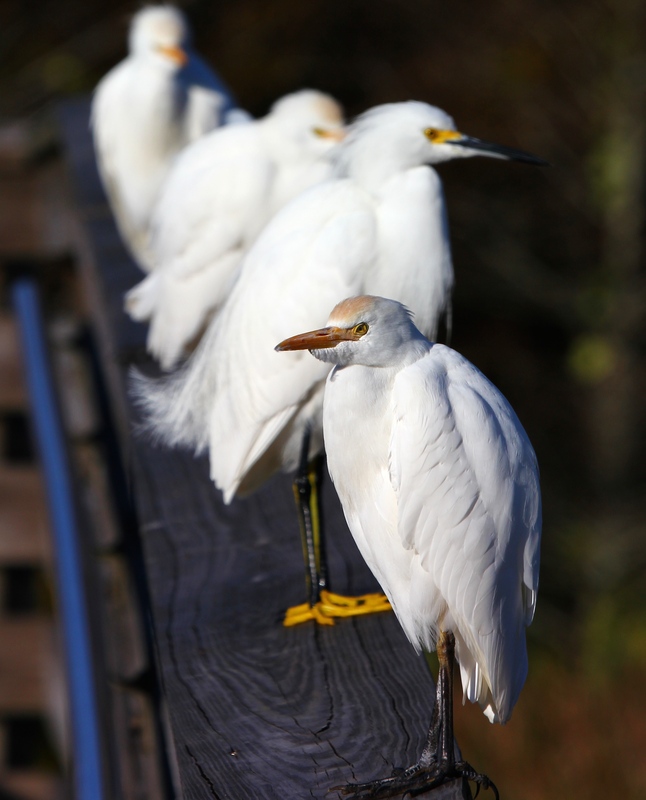 This entry was posted in Birds and tagged Cattle Egret, Great Egret, Snowy Egret, Wood Stork. Bookmark the permalink. But for their yellow feet the snowy egret and the cattle egret are very similar. Nice shots! Thanks! 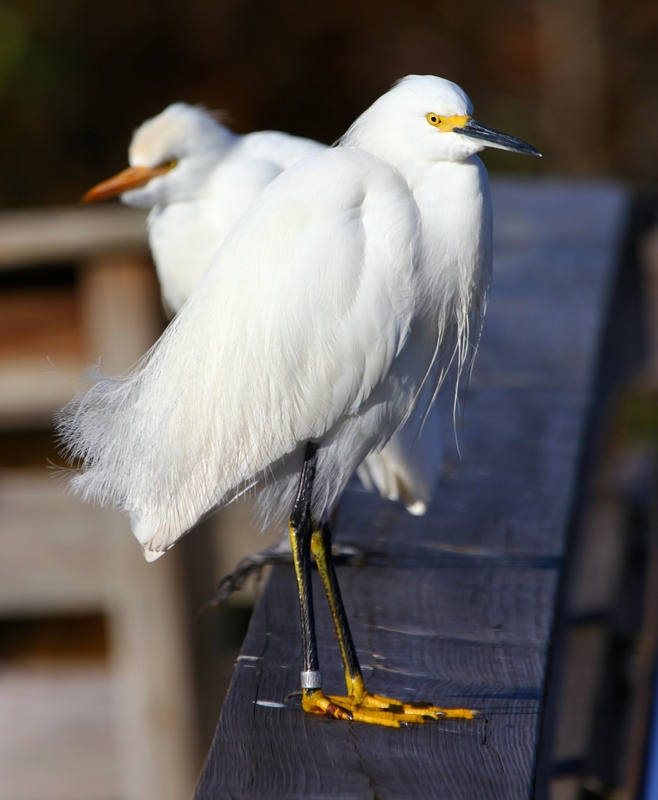 These two kinds of egrets are about the same size, but actually differ in the color of their head feathers, feet and beaks. I think the Snowies are much more elegant ;-), and the Cattle Egrets can be rather comical. In breeding season, the colors on both are remarkably striking, as with most of the wading birds. I’ll be posting those in the coming months for sure! It’s interesting to see how those yellow feet do stand out in the 2nd photo. Cattle Egrets must be one of the more widespread species in the world. The cattle egret on the rail is my favorite. I don’t see them here. I don’t see storks either. They are not the most attractive of birds but they really are interesting to look at. Wonderful images. I see the egret is banded. Are many of the birds there banded? Good question about the band on this egret, Donna. No, I don’t recall ever seeing banded birds in our wetland preserves, and I’m not sure why this one is unique. Now that you mention it, maybe there are others that I’ve just not noticed (?). Will ask my local Audubon friends about this and see what I can find out! You’re so kind, Jet! Thanks very much for your visits and comments. Wonderful to find a kindred spirit so attached to the lovely wetland birds which grace our South Florida landscape!! It does seem unusual to see the banded Snowy..what were you able to learn about that? Yes, it is! Having spent my whole life in upstate New York till fairly recently, I have been so excited to learn about the birds in Florida, and to live so close to many beautiful wetlands! You remind me that I did not yet find out about that banded snowy egret. 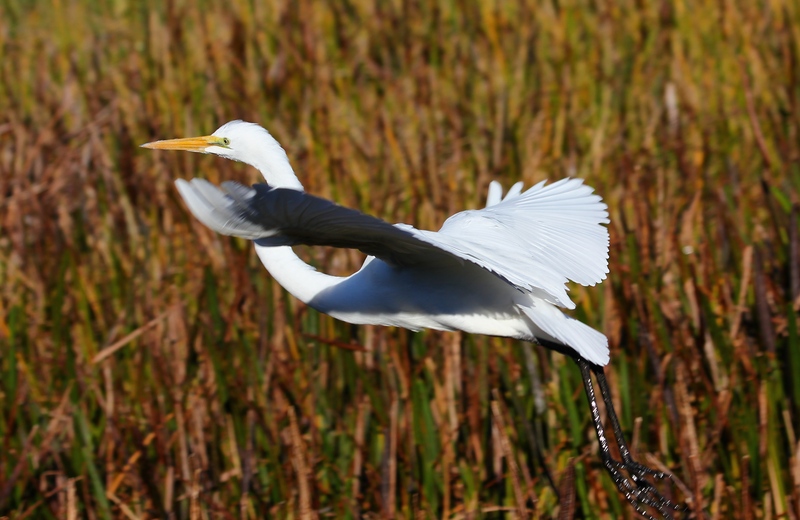 Hmmm… Tomorrow night is our Audubon Society of the Everglades monthly meeting – I’ll ask!